So tomorrow marks the start of my favorite time of year – FALL. 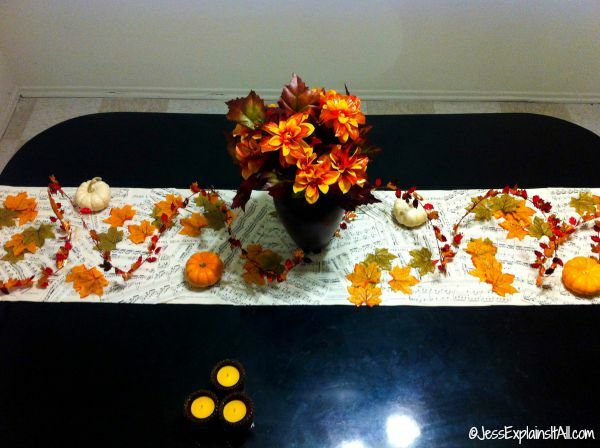 September 23 is officially the start of fall, and to kick off the season, I thought I’d share a fun DIY project to bring the season right to your home! There’s so many reasons to love fall. And since I love both fall and listicles, let me make a “reasons why fall is awesome” listicle just for you. For one, let’s talk about pumpkin everything. Is it too overdone? Overhyped? Maybe… but it doesn’t stop me from loving every latte, cake, pie, cookie, or craft containing anything and everything pumpkin!!! 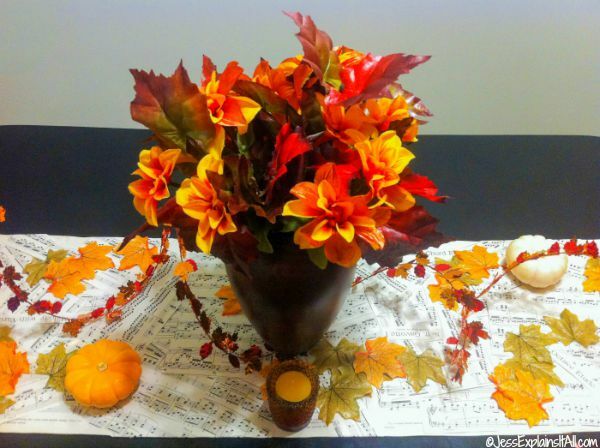 Fall is an excellent time for crafts and DIY projects. I firmly believe that even the least crafty people come out of the hiding to make crafts and DIY projects during this season. Fall is the perfect excuse for parties. Halloween parties? Check. Potluck parties? Check. Costume parties? Check. DIY-PROJECT-PUMPKIN-FLAVORED-PARTIES ALL DAY EVERY DAY… Uh… that one might be just me! 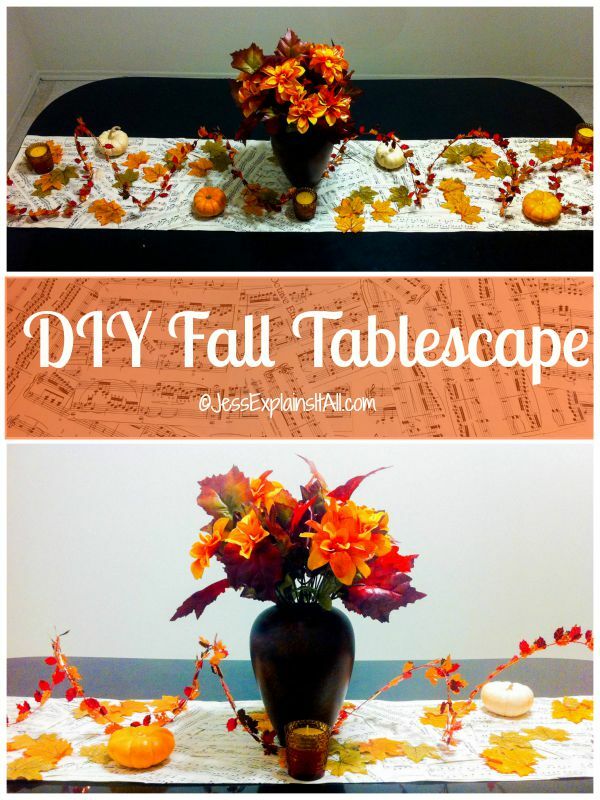 By the end of this post you’re going to have learned how to make that ^ awesome DIY Fall Tablescape pictured above. Are you excited yet? I AM! This is actually a project I made two years ago for fall. Two years ago? 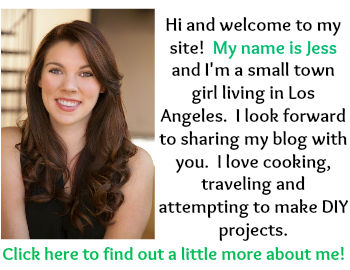 And I haven’t blogged about it yet? Well, to be very honest, I started my blog back in July of 2013 wrote very diligently until November of 2013, and ended up taking a veeeeeery long break until July of this year (2015). I wasn’t really ready to undertake the time commitment of blogging at that point in my life (having just moved 3300 miles across the country to my new home here in LA), even though I really love blogging – but now I’m back with a vengeance! So I had a couple fall projects I hadn’t blogged about previously, and I’d love to share them with you now. ?????? First step: Gather all of your supplies. I’d recommend checking your local yard sales or dollar stores for these items, because you might find them for a little less, but if you’re all ready to go, the links below are to versions of these supplies on amazon (I think some of them are even prettier than what I used). Next: Make the music runner. 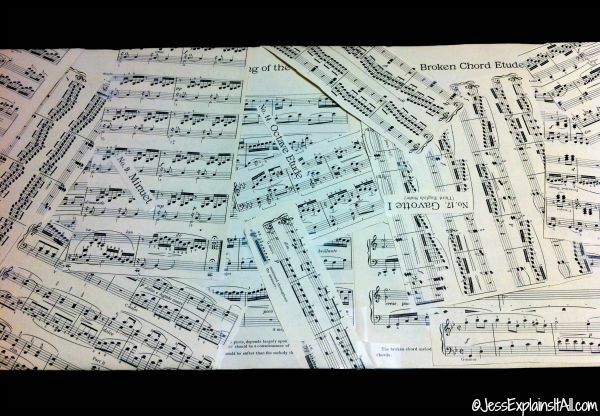 I found some sheet music at a yard sale, and I’m sure there are musicians out there cringing that I chopped up these songs, but honestly, as a musician myself, I’m ok with it! 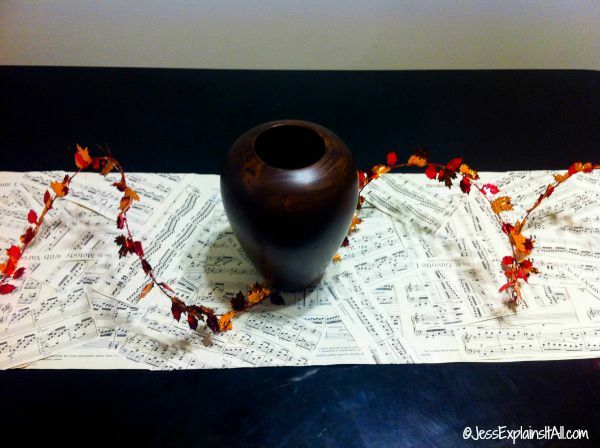 I know it’s not what the music was originally intended for, but I think creating new art out of something old can be a new way to appreciate it! I took a bunch of different classical songs (that’s what I had), and laid them out next to each other to form the base of the runner. Then I chopped other songs and layered them on top to make it look more like a collage. This part is fun! Let it be messy! Then I taped them all together. Pro tip: I would recommend laminating this if you want it to be able to be clean-able… OR even lay it pattern side down on saran wrap and tape it to the back, just so you can wipe it off. Because it’s only paper…and if you host parties, or have roommates, I’m pretty sure it will get trashed. Next: Start layering and build the framework. For this step it’s very important that the garland is made of wire. You need to bend the ends into a hook and hook them around the edge of the table. This keeps the wire in place. Also, tape helps secure it. Having the wire garland makes the whole process easier, because it holds it’s own shape, and takes a lot of the battle out of creating the DIY Fall Tablescape. I put the vase directly in the middle of the wire to hold down the middle part as well. 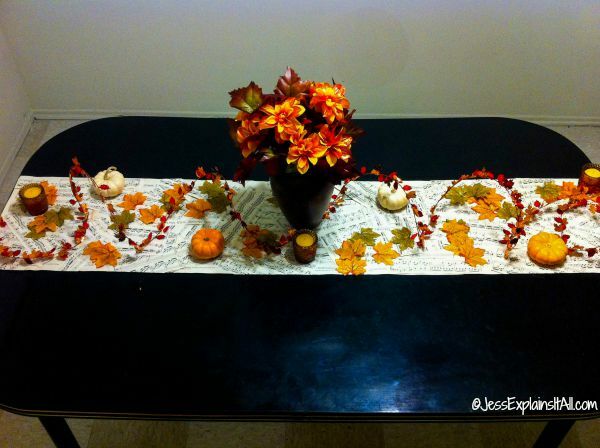 Now that you’ve put down these three pieces, you have the skeleton of your tablescape. Next: Fill the vase. 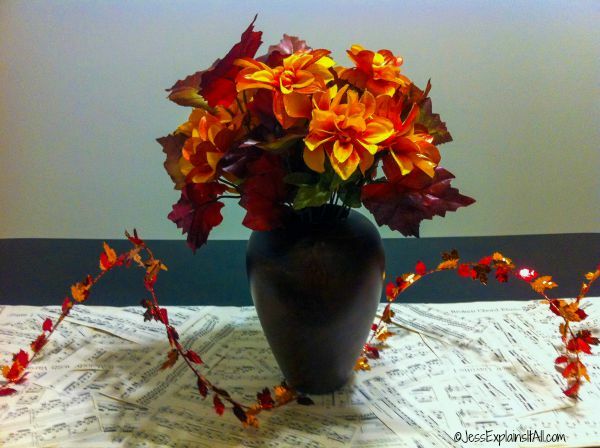 This was fun for me, because I enjoyed mixing the bunch of fake leaves with the bunch of fake flowers, to get just the right blend of colors and the arrangement to sit how I wanted. I’m very happy with the end result. The colors are so vibrant! Next: Pumpkins! ???? 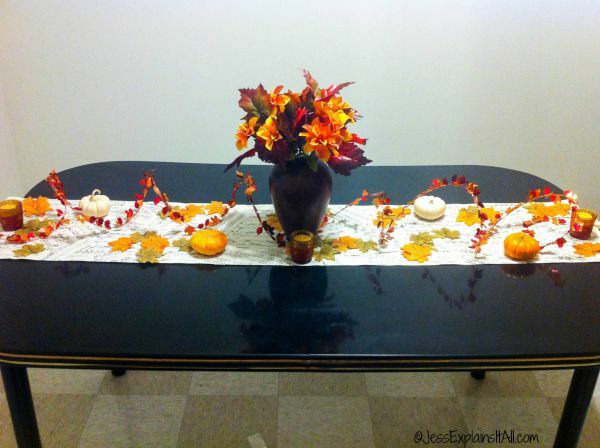 Take your pumpkins and space them out on the music runner. If you’re super OCD like me, and are obsessed with symmetry, this step will take more than two seconds like it would for any normal person… LOL. Next: Candles! 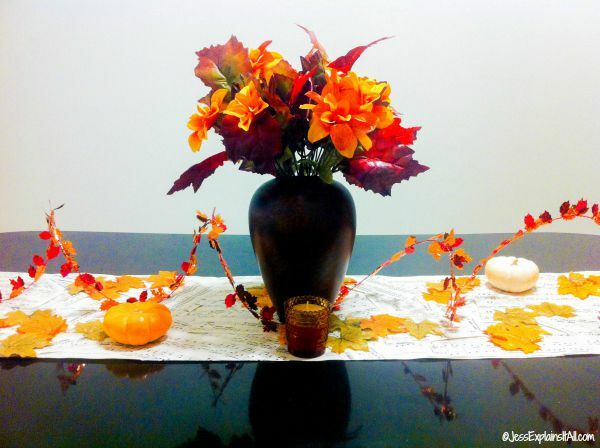 I had three orange-ish candles I found at a yard sale, so I arranged them (symmetrically, of course) on the tablescape. I like the little ones, because they blend in, but if you’re going for a more dramatic look, feel free to use large candles! 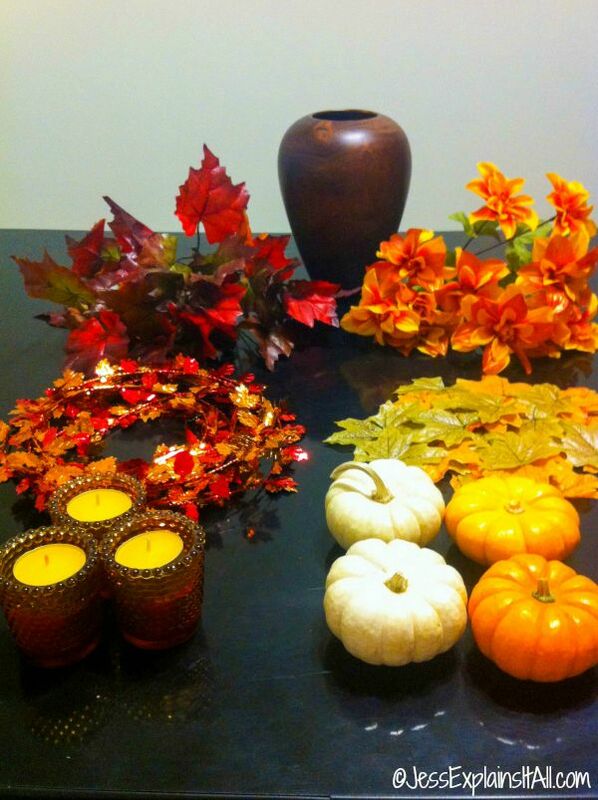 I scooted out all the chairs while I was making the DIY Fall Tablescape, because I found it easier to work that way. Once they are back in place, the whole project is finished! 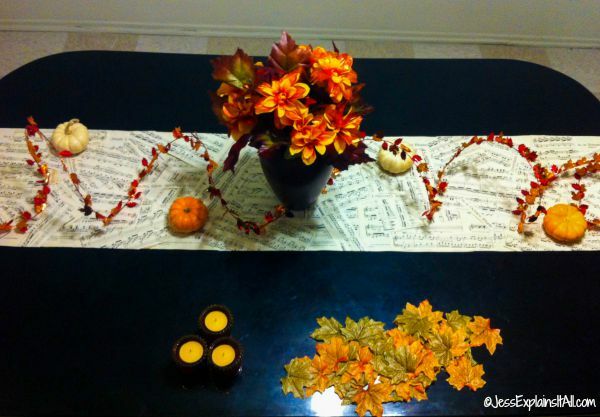 Also, totally unintentional, but the gold stripe on the table looks great with the tablescape. Yay for lucky surprises! Here’s a closeup of the final project! WOOOO FALL! 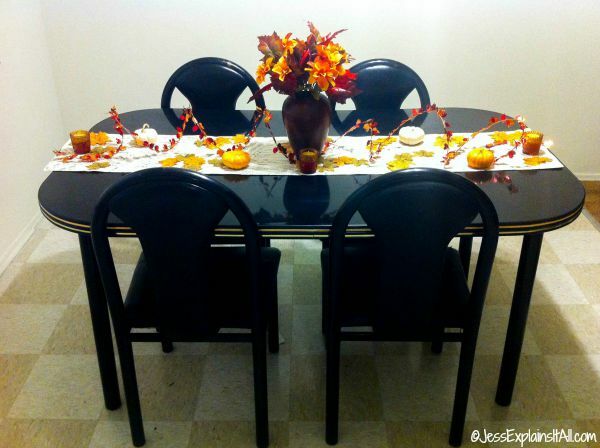 I wish I still had a dining table so I could make something like this project this year. Can you imagine grabbing a few friends and sitting around the table eating dinner? How fun! This project is super simple, but looks very professional when it’s done. I encourage you try it this fall! If you do, make sure you tag your pictures with #JessExplainsItAll. 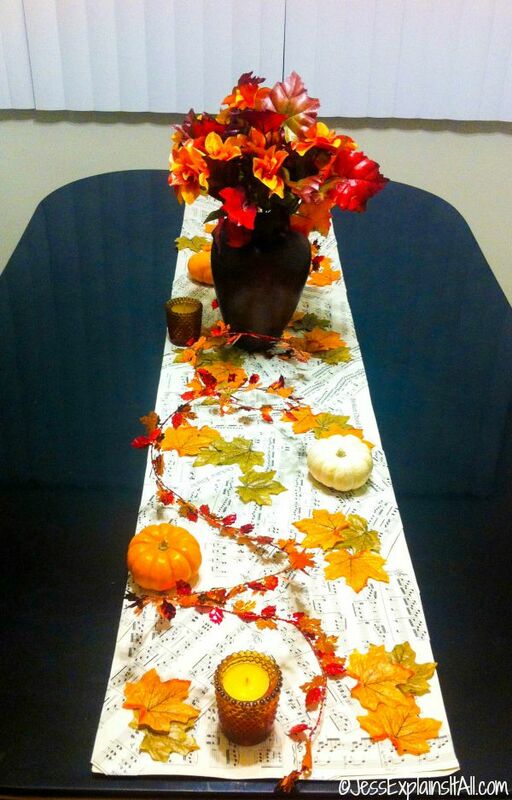 I’d love to see your DIY Fall Tablescape! 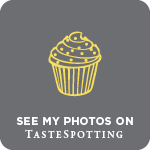 And if you liked this post, and are thinking of hosting a party, check out my article on 7 Tips to Stand out at a Halloween Potluck. LOVE the tablescape. Just love it! I’m glad you like it. It was SO much fun to make! So easy too! ??? ?